Please, please, please, whatever you do. Don’t buy stock, especially not seafood variety from the market. It’s so easy to make at home and costs a fraction of the store-bought kind and is so much yummier and nutritious. 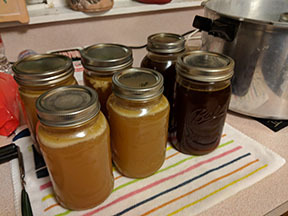 I can my stock in a pressure canner in quart jars for 35 minutes at 10 lbs. of pressure. But you don’t have to can it. You can freeze it for up to six months (mine rarely lasts that long), or use it fresh within two days. 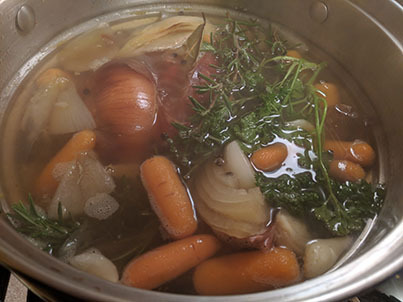 Chicken, Pork, or Beef, or I’ve even made Lamb or Duck, stock lasts a bit longer than seafood in the fridge — about two weeks –, but it’s still the same in the pressure canner. However you decide to store it — it’s super easy to make. You’ll never want to use store-bought stock again, especially when making chowder, seafood stew, paella, or the like. Take the time to bake/roast the shells. It gives the stock a richer flavor and decreases the “fishy” smell while the stock cooks. I use a giant pasta pot with detachable strainer. That way you can pull the shells out and cook it down for the long version of the recipe. Short version, mostly noted here, takes three hours. For the long version, you just cook it down a bit longer before canning. Many people say that the roasting of the shells is not necessary; but, I feel like it gives you a better flavor and minimizes the “fishy” smell while you’re brewing up a batch of Seafood Stock. My advice? Don’t skip it. The ingredients are easy and don’t require a whole lot of prep. If you have an insert strainer for your stock pot (I use a tall spaghetti pot combo), it makes this task even easier. Heat oven to 450 degrees. Place shells in a baking pan and roast for 5-8 minutes, until they begin to turn golden. 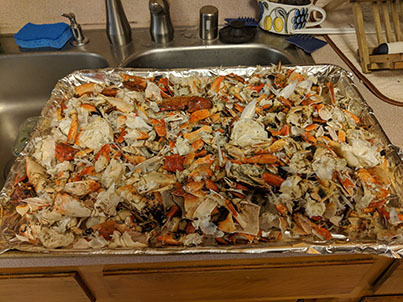 Place shells in a large stockpot (if you’ve got the stockpot/strainer variety, I highly recommend it), cover with water no more than half an inch above the level of the shells. Add onion, carrots and garlic. Heat on high until small bubbles rise to the surface. Reduce heat to medium and cook for one hour. From time to time remove any scum (gray bubbly foam that stays on the surface) by scooping it off with a spoon. After one hour, add wine, tomato paste, rosemary, parsley, bay leaf and peppercorns. Cook for another 30 minutes. Strain the stock (If you don’t have the pot/strainer combo you’ll do it through a fine mesh strainer, discarding the solids). If you’re doing the all-day method, just cook down after you strain the stock at least about an inch in the pan. The result for this extra time investment is an even richer stock. Refrigerate for up to two days, or pour into plastic containers with at least one inch of head room and freeze up to six months. If you pressure-preserve can, it will last in the larder up to a year. Again, it never lasts that long in my house. 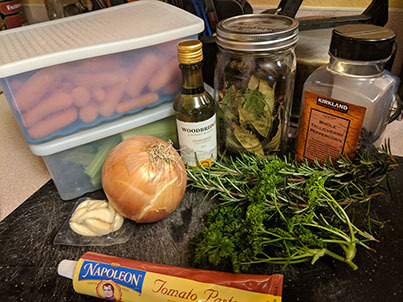 This recipe is a four-star recipe because the rosemary and parsley were picked fresh right before, and the bay leaf is from my microfarm, too. Lastly, the shells I harvested myself as well. During the summer, it would be easy to have the carrots and onions at my disposal — so this recipe has the capability of being a six-star recipe. Again, for those new to the blog, each recipe gets a star for each item that I have grown/harvested/cooked myself — hence, Harvest Creations. This stock, in turn, will turn into a star for other recipes.